​Learning to paint is difficult. To make an analogy of the learning process: imagine that you are tasked to learn a difficult subject solely from reading books. And then you find that the books are in Sanskrit ! And so it is with art. The complexity of learning to paint is a function of its many different aspects. The ‘Language of Art’ includes the craft of painting-the technique. Without a grasp of that, you’re lost. But with it you still only have part of the package. Other challenges await. The critical element in Art Education is learning to see as an artist. It is a difficult challenge, but the shortcuts all lead to the same place, and it’s not an attractive one. When you begin to visually comprehend the world around you, things will open up. Technique begins to take care of itself. A growing confidence follows a technique that is observation-driven. Reacting spontaneously to nature is your birthright as an artist. Don’t trade it for dubious formulas or techniques. I believe a good workshop begins at four o’clock on Friday. My goal as a teacher is to put my students on a path that is self-sustaining, where an ever-increasing visual understanding drives the painting process. My classes are open to students at all levels, beginners to advanced. The classes include lecture-demonstrations and an emphasis on individual assistance. 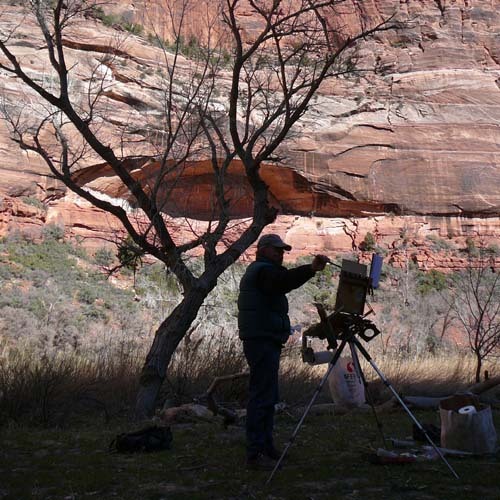 In my oil classes, watercolorists are welcome; demonstrations in oil; and vice-versa for the watercolor classes. I look forward to painting with you.